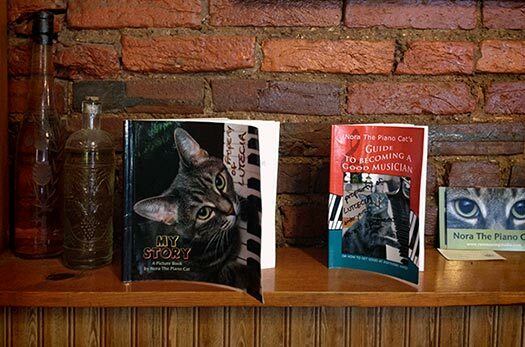 If you’re ever in Philadelphia and find yourself enjoying soup, salad, sandwich, croisant or other pastry at a charming little French cafe called Lutecia, you’ll notice well-thumbed copies of my books “My Story” and “Nora the Piano Cat’s Guide to Becoming a Good Musician” sitting on the shelf along the west wall – that is if they’re not being presently enjoyed by another cafe guest. The books will be your clue that the world famous diva (moi) resides barely a block away. Think an audience with the diva might be fun? Just drop me an email at nora@norathepianocat.com and I’ll have one of my personal assistants get back to you. You’re the cutest, Nora. Wish I was travelling your way.